I'm almost embarassed to show you this DIY project. Not because I don't like it. On the contrary. I like it A LOT. But…since it was so easy, I'm not sure I can even call it a DIY "project." 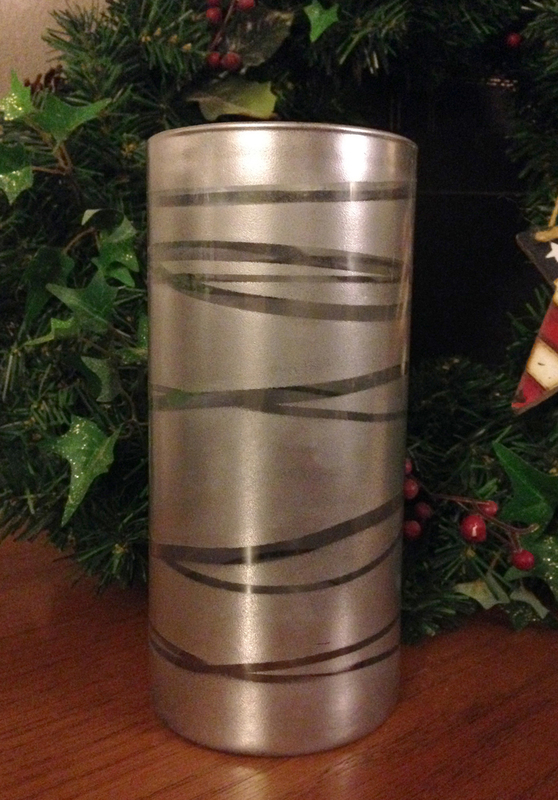 Last week I showed you how to paint a silver painted decorative vase. Today I'll show you how to arrange silk pointettia flowers in that same vase. Why do people pay $30.00 for a seasonal flower arrangement? 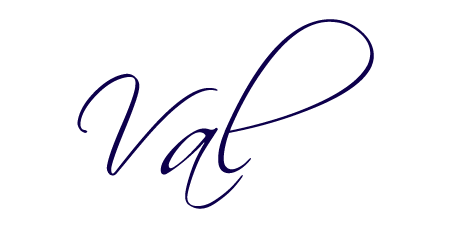 Let me encourage you – Do it yourself! 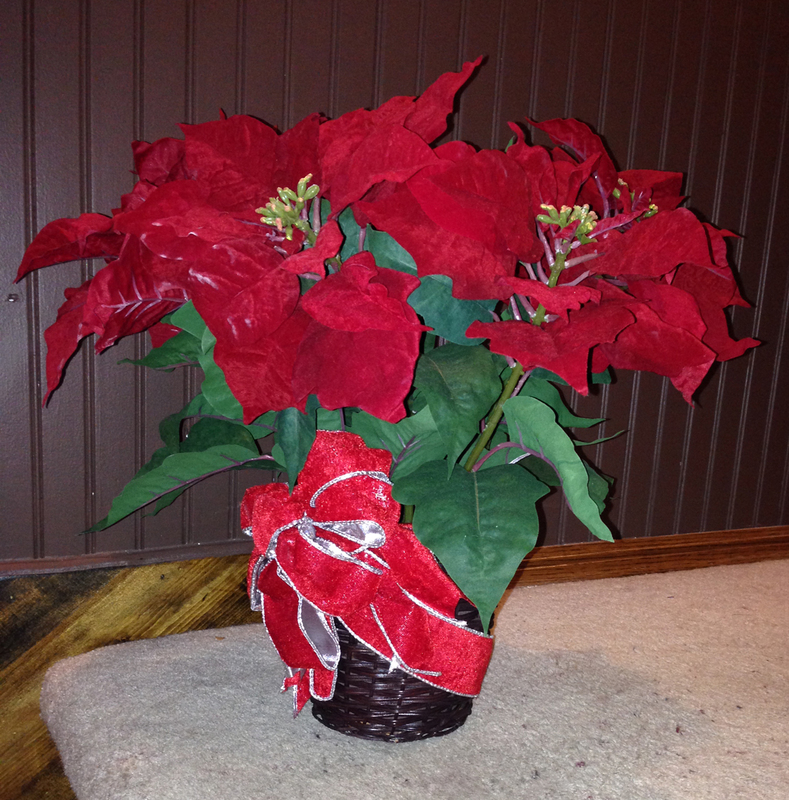 This is what I started with – a typical fake poinsettia plant. It cost me "nada." I like "nada." "Nada" makes me happy. Can anyone say, "Gag me?" I'm sure at one time it was considered lovely. OK, I'm not sure. But somebody had to have thought it was something of value. Sorry if you're the one who bought this for church. I got it about a month ago in the "Give to Goodwill" pile when we moved into our new church building. One trait of a successful diy'er is to be able to see things in parts when the whole isn't so lovely. Here I saw pretty silk flowers that probably cost somewhere from $2 to $4 each if you were to buy them at Hobby Lobby, Joanns or Michaels. I figured I could pull them out and reuse them, pitching the rest. Yesterday I bought 3 floral picks from JoAnn Fabrics. Originally they were priced $1.50 but I got them 70% off. That made them for $.45 each. I know, just call me a big spender. They were nothing special – but the devil is in the details. These are going to add some depth to my arrangement. Remember? I painted it last week. See the tutorial here. I pulled out the flowers and took off the bottom layer of leaves to use in my floral arrangement in a pumpkin for Thanksgiving. 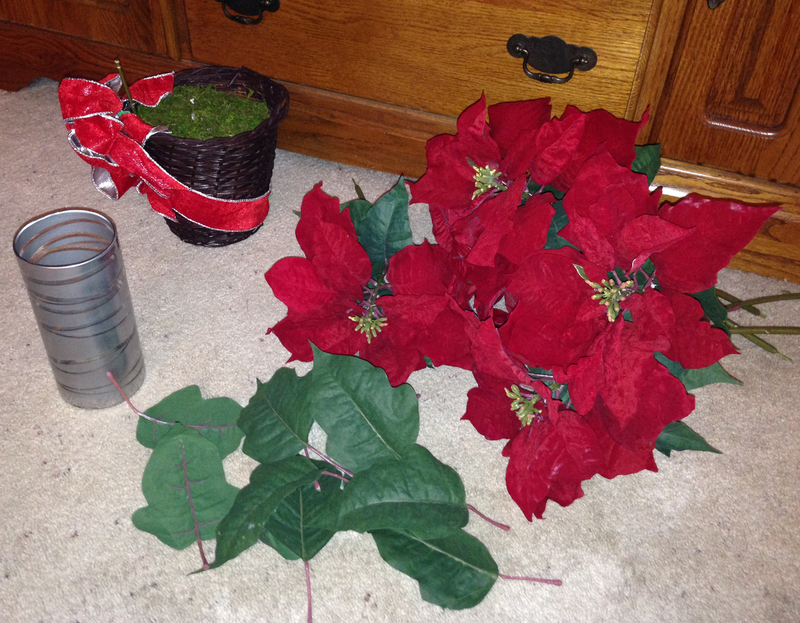 I had been thinking all day about how I was going to arrange the poinsettia flowers in the vase – what to use in the bottom to grab the stems, how tall to make them, which way to bend them, etc. But in the end, all I did was stick them in the vase! After that I just added the floral picks and it was done. I think I spent more time arranging the photo shoot for the final product than I did in putting it together. Now tell me again why you would pay $30 for a ready-made floral arrangement at a store? Here's one at Kohls on sale for $39.19, regularly $55.99. Don't get me wrong – I love L.O.V.E. Kohls! But, I only I spent $1.35 for the floral picks, a few cents for the silver paint for my vase, and had free flowers. 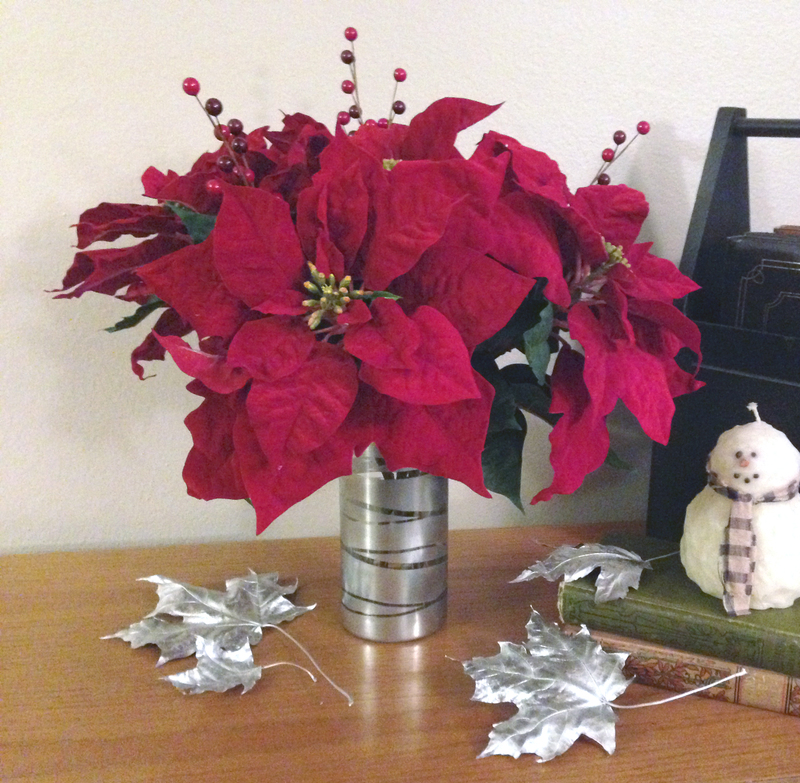 I have a pretty poinsettia flower arrangement for under $2.00. What do you think? Want to buy one at a store for $39.19 or make your own for under $2.00? Now I have $37.19 left over to spend on Christmas gifts at Kohls. My DH would say that's not good reasoning, but it works for me! Oh, and BTW, the silver leaves in the picture are from my project – DIY Metalic Leaves. Very clever and very nice photos. Thanks for sharing this simple DIY. Thanks Barbara, your chicken cacciatore recipe looks delish! Thanks for stopping by. I can't believe the difference your vase and those picks make. Love the silver leaves too. Beautiful work, even if it wasn't much work! Thanks, Donna. I really was surprised at how easy it was. Thanks for stopping by. It looks great, and I love your metallic leaves! Thanks for linking up at the Bloggers Brags Pinterest Party. I pinned this to the Bloggers Brags Pinterest Board.